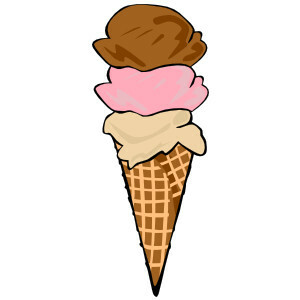 When I was a kid, my Mom used to have this laminated ice cream cone (flat paper) on the closet door in the kitchen. Each cone had our name on it. And every time we read a Friend magazine article we would earn a paper laminated scoop of ice cream for our cone. And at the end of the month she would take us out for ice cream. But actually, we usually went for Frozen Yogurt which has always been the in-thing here in St. George as long as I can remember. The trendy hot spot back then was Dixie Frozen Yogurt. It was in the old shopping center on Bluff where K-mart is still located. It was always a welcome treat. I loved getting gummy bears on my frozen yogurt. Now all the frozen yogurt places are self serve and you always spend too much money! 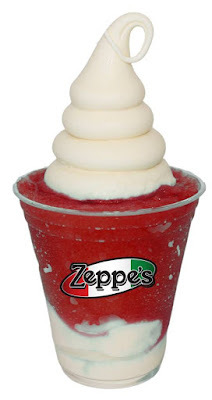 Okay, there are several yummy frozen yogurt and ice cream places around here now, and I will review each of them another day, but today, I want to tell ya'll about Zeppe's Ice. It's different from Frozen yogurt because it's fruity ice! The other day we went in for a little Monday family night treat and ordered the Gelatta. Which is a combination of frozen yogurt/custard and Italian ice. It's not like snow cone ice though, its like a fine fruity ice. Zeppe's website describes it as a frozen fruit puree the consistency of ice cream. Well, anyway, it's worth trying and it's delicious. I tried coconut flavor which was divine... oh goodness, need some right now! And I had pink and blue... which were some other fruit punch Hawaiian flavors that the kids enjoyed. By the way, this joint is hot on Monday nights, might want to go in when it's less crowded like during the day. They have a variety of seating inside and out. And if you are coming with a minivan full of kids, call ahead and they will bring it out to you in your car! Very family friendly business. Oh goodness, another great thing about being back in a southern warm climate area of the United States is eating frozen desserts again. I seriously gave up ice cream after a while when I lived in a cold climate, but now we are back to enjoying it regularly. A great thing about Southern Utah, really, all of Utah is that there are plenty of dessert places to go. Not a lot of bars in Utah (with the exception of Salt Lake City), because the general Mormon population doesn't drink alcohol, but we eat lots of sweet stuff, yes we do!